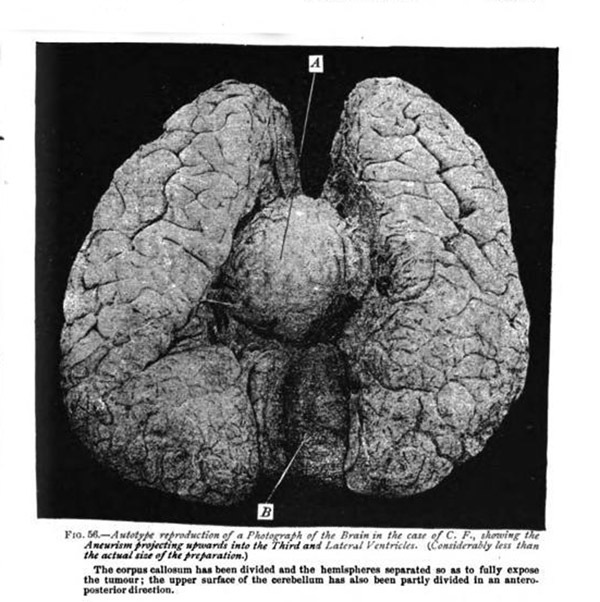 Journal : Edinburgh Medical Journal, vol. xxxii, part 2. London : Simpkin, Marshall, & Co., 1887. Description : pp. 911-922 ; ill., 5 photo., 1 woodcut fig. ; 21.5 cm. Photographs : 5 in-text autotypes. 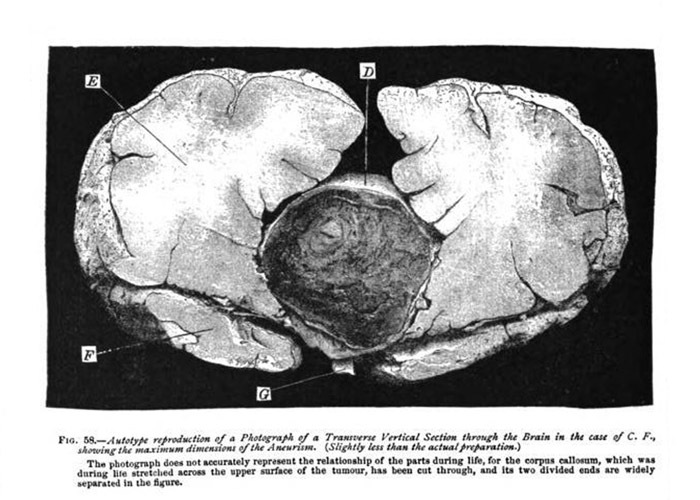 Subject : Brain — Tumors ; aneurisms. Author caption: "By BYROM BRAMWELL, M.D., F.R.C.P. (Edin. ), Assistant Physician to the Edinburgh Royal Infirmary ; Lecturer on the Principles and Practice of Medicine, and on Practical Medicine and Medical Diagnosis in the Extra- Academical School of Medicine, Edinburgh. " Revised: Intracranial tumours. Edinburgh: Young J. Pentland, 1888 (vide intra »»). President, Royal College of Physicians, Edinburgh. 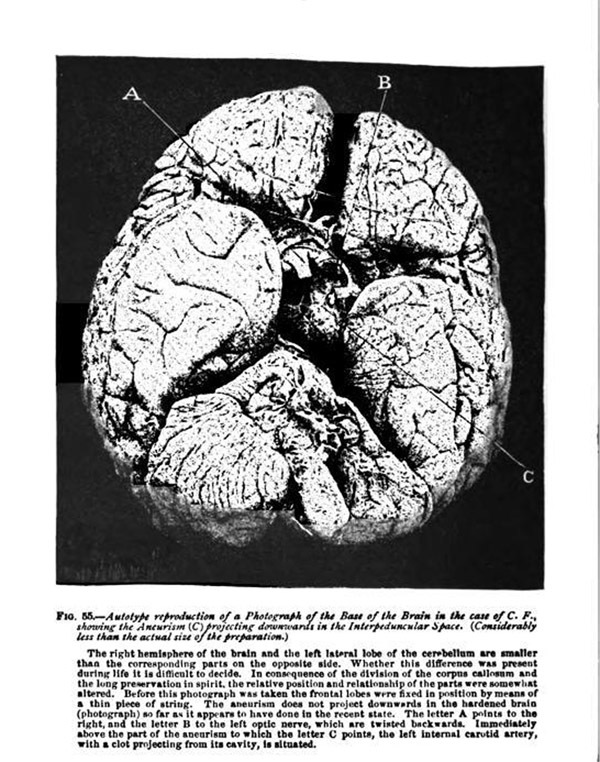 "Obesity has been frequently observed in cases of tumour of the pituitary body ; but whether it results from the fact that the pituitary body is involved, or whether it is due to the changes which a tumour in this situation produces in the surrounding portions of the brain, does not seem clearly established. 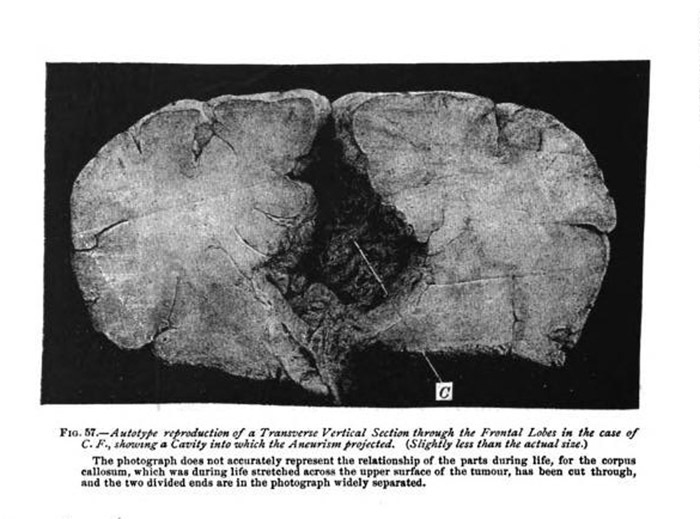 The exact position of the tumour and its relationship to the surrounding parts of the brain, after the corpus callosum had been cut through and the preparation hardened in spirit, are well shown in Figs. 55, 56, 57, and 58, which are autotype reproductions reduced from photographs of the natural specimen. 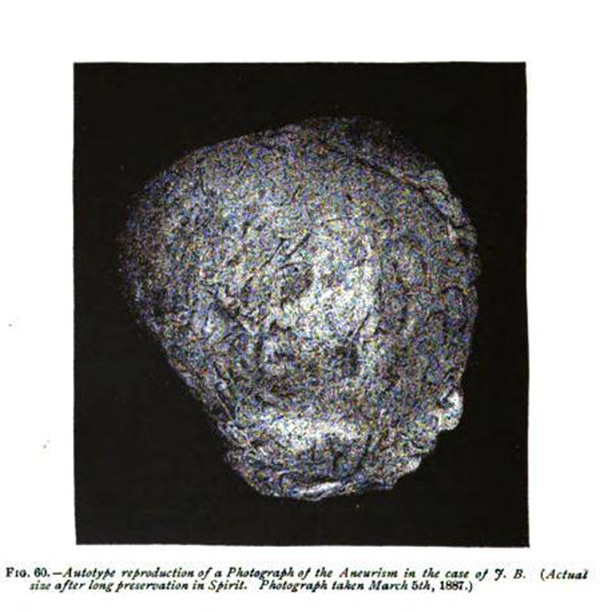 In Dr Clouston's case, which I will now report, the aneurism was still larger, measuring, after it had been preserved in spirit, 2 3/4 x 2 1/4 X 1 1/2 inches. "—page 918.